I'm the type of guy who likes to get things done ahead of time. When I was an undergrad CS major, I was the guy who turned in programming assignments early. No stress, no all nighters, just planning. That's what's so strange about Field Day for me. I didn't get around to deciding to participate until Saturday at 12:30 p.m. on the big day. 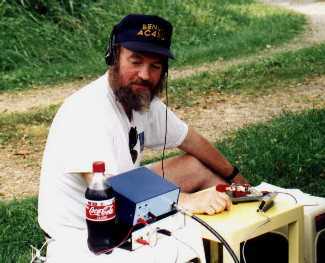 When I saw the June QST, I was drawn to the article about running QRP on Field Day. 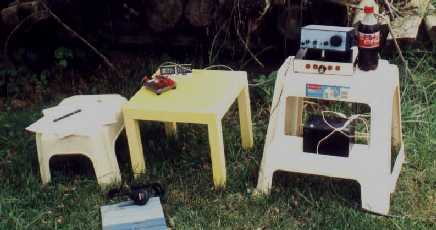 My first idea was to work using solar power with a QRP rig and an easy to install antenna. I thought about using the Ten-Tec 40M QRP kit, but I finally decided on the NorCal Sierra kit because it could operate on multiple bands with the insertion of different band modules. The output of the Sierra was only 3W, but the current drain was fairly light for battery operation. I decided that I could put up an inverted vee antenna for 40M and also use it on 15M. After planning a Field Day setup, I tried to decide if I really wanted to invest the time, money, and energy building a kit. I spent weeks putting off deciding until I was almost out of time. At the last minute, I decided to order the Sierra. If I got the rig together by Field Day, I'd participate in the event. I still wasn't committed. 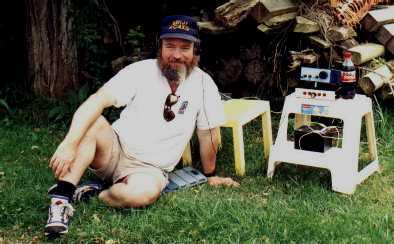 If I didn't make Field Day, I'd still have a QRP rig that I wanted anyway. 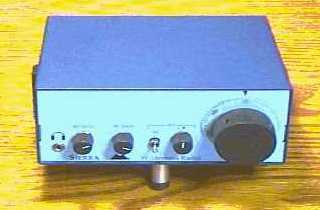 I then found that Wilderness Radio, which makes the Sierra kit, wouldn't take credit cards. This added several days to the project as my money order flew to California. I received the rig about 2 weeks before Field Day. I worked about a week and a half on the rig. My shack is on the second floor of the house and it's not cooled, so I had the side benefit of losing weight in the heat. The Sierra comes in three parts: the main board, the chassis, and one or more band modules. I finished the main board and chassis on the Wednesday before Field Day. I started the 40M band module on Thursday and finished it on Friday (including winding 8 torroids). So finally, I was ready to test and align the rig. On Friday night, I did a preliminary test and the rig worked first try! Having been a software developer for most of my adult life, I never expect anything complicated to work the first time. But the Sierra did work. I planned to get up the next day, align the rig, and decide about Field Day. Saturday morning, I was greeted by a sick cat. I took Oreo to the vet and returned about 10 a.m. I was successful at aligning the rig. 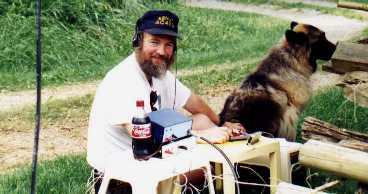 At 12:30 p.m., I performed the ultimate test: I called CQ on 40M CW. After a few minutes of calling, I made a contact with a station in Ga. And, it was a "go" for Field Day! This late in the game, I decided not to build the 15M module, but to work 40M exclusively. I had already dropped plans to charge my battery with a solar cell. I headed outside with a slingshot to get a line up in a tree for a 40M inverted vee. After a few tries, I called in the big gun. Sue Ellen, KD4LQO, came out to help. With some suggestions from her, I was making progress with the line, but still didn't have one where I needed it. I finally turned over the sling shot to Sue Ellen, and after a few tries, she had a line at 35 ft. for the dipole. 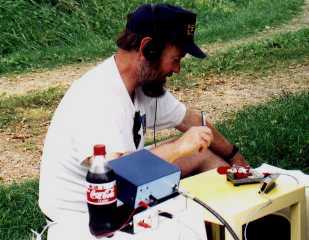 We finished constructing the dipole; I brought out some rubbermaid products to use as tables; and I brought out the rig, keyer, and battery, and some paper for logging. I was ready to go. It was 4:50 p.m. local time. I wondered if anyone could hear me with only 3 watts. I tuned in a station, waited for him to finish his contact, and I called him. He came back with my call and the Field Day exchange. I was in business. I worked a few hours on Saturday before sundown and an hour or two on Sunday before the majority of Field Day stations ended their operations. My pace was leisurely. Each contact was a thrill since I had not been sure I was going to work Field Day until the last minute! 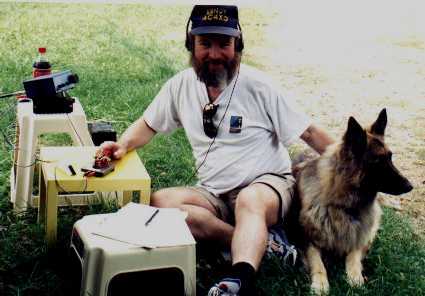 There was an added thrill working QRP for the first time.My strategy was to try to find and work the louder stations instead of trying stations that were weak and maybe couldn't hear me. Only a few stations I called couldn't hear me. Only one station that heard me couldn't copy me. 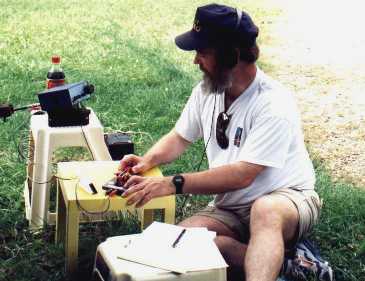 I made 54 contacts at 10 points each (2 for CW x 5 for QRP) plus a hundred for emergency power for a score of 640 points. What will I do different next time? I'll have band modules for several bands, I'll have a solar panel to charge the batteries, and I'll plan the station layout. Operating sitting on the ground was tiring. I will also enlist the help of KD4LQO early in the process of antenna construction. And how about the black bear? I was operating near our mulberry tree. I think bears really like mulberries. Well, a neighbor told me later that a black bear was seen going up my driveway over the weekend. I did see what I think is evidence that a bear was in the area. I didn't see him, but he was welcome if he could work CW. Sue Ellen Cline, KD4LQO, for encouragement, pictures, and station setup and take down. She also offered editorial advice on this text. Mike Barts, N4GU, and Joe "Obie" Price-O'Brien, WA4DOX, for encouragement and suggestions. Obie gave me the fancy military dipole center insulator (with an adapter so it would mate with a PL/259 connector). Phil Benchoff, N3PB, gave me a surplus 12V, 8 amp-hour battery. See the stations I worked. 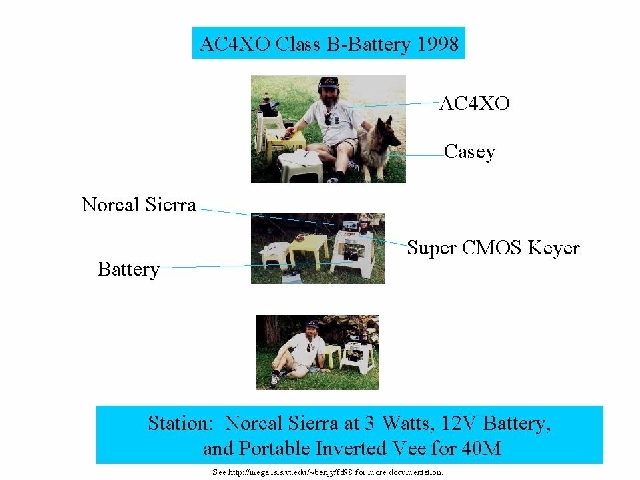 See my proof sheet to the ARRL, demonstrating I used battery power and QRP power levels (low-res). Click any picture to see the full-size version with proper aspect ratio. 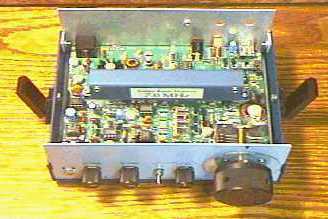 Note that the pictures of the NorCal Sierra shown at the the Wilderness Radio page show the rig with the optional KC2 keyer, frequency counter, S-Meter, and wattmeter with the optional front panel. See my thoughts on the NorCal Sierra. Back to Benjy's ham page.